At 19h22 GMT (21h22 local time), a 3.2 earthquake occurred at the little-known submarine volcano Kolumbos ca. 8 km NE of Santorini, Island, Greece. This marks one of the largest events in recent months. The submarine volcano whose peak rises to just 18 m below sea level, is located on the tectonically active SW-NE fault system across Santorini which confines most volcanic vents of the Santorini volcanic complex in the past 500,000 years. Kolumbus volcano last erupted in September 1650 following a year of frequent earthquakes. The eruption produced a large explosive pumice eruption, with ash fall recorded as far as Turkey, and built a temporary island. The main phase of the eruption triggered a devastating tsunami. Toxic gasses killed more than 25 people and hundreds of livestock on Santorini by suffocation (probably H2S). 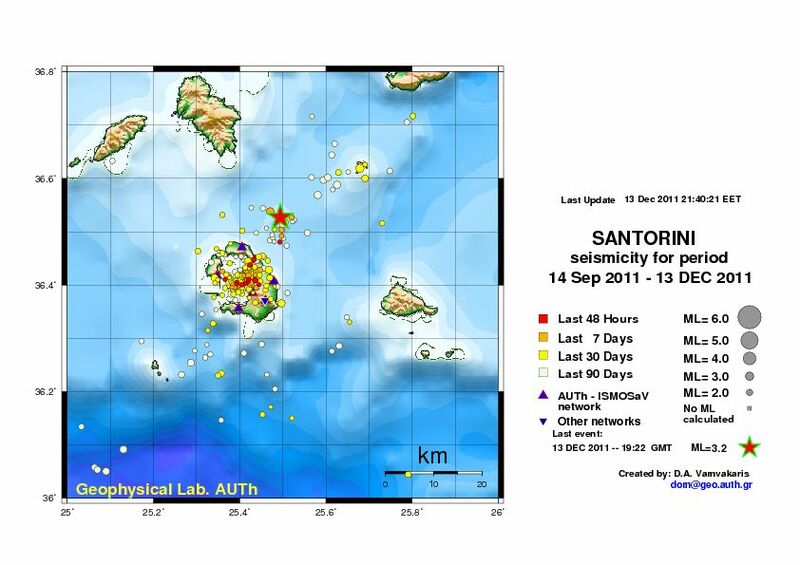 There is no reason to state that new activity from Santorini or Kolumbus is likely in a foreseeable future but on the other hand, there are very few data available, unfortunately, to judge the situation.